The stunning Dominion Theatre is located at 268- 269 Tottenham Court Road, London, W1T 7AQ. It has one of the largest seating capacities in London Westend with huge occupancy of 2163 and spread all over two levels as Stalls and Dress Circle. Stalls has the largest seating capacity and closest to the stage gives best of the views. Currently, We Will Rock You is running with packed houses at the magnificent Dominion Theatre! Dominion Theatre is located just opposite Tottenham Cour Road tube station. This is one of the most accessible location in London. 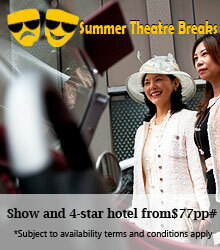 Moreover theatre is located near some of the major attractions. You can enjoy some great food as there are lots of affordable restaurants and bars. The stunning theatre is accessible via major modes of commutations such as tubes, buses, taxis or cars. Although, Dominion theatre is one of the largest Westend theatres still it is made up of two levels. For both the disabled guests and carers, theatre also offer discounted tickets. For the induction loop, there are 24 headsets, whereas an infra-red system installed in the auditorium. Dominion Theatre was constructed from the year 1928 to 1929 on a venue of brewery and funfair. It was designed by W and T R Milburn. During the opening years, theatre underwent huge financial loss. In the year 1933, theatre was bought by Gaumont British cinema and hosts some of the most popular movies of the era. Once again theatre became a hot venue for live performances and the famous The Judy Garland show went on becoming a huge success followed by some popular musicals like Grease and Beauty and the Beast. Since 2002, Ben Elton’s super successful We Will Rock You is ruling millions of theatre lovers. The show has become the longest running show and won huge critical and commercial acclamation. Experience the magic of stunning London show, We Will Rock You at the magnificent Dominion Theatre! This is one of the most successful London musicals of recent time. The show made its opening with some negative reviews but went on becoming one of the most blockbuster London shows with long spell of more than 12 years. The electrifying musical also won prestigious Olivier award for the Most popular long running musical. The jukebox based show featuring song of iconic pop/rock group, Queen led by Freddie Mercury. With 25 of the biggest chartbusting hits of band, the rocking show is certainly a delightful experience for the rock lovers. The spectacular production at the Dominion Theatre is simply foot tapping with some of the greatest rocking numbers. We Will Rock You is set in a futuristic dystopia where all kinds of music has been banned. The show features some of the rocking hits like Radio Gag a, ‘I Want to Break Free’, ‘Somebody to Love’ and ‘We Are the Champions’. The two hours and forty five minutes show features some soft adult themes and ideal for kids above 10. The lead characters of the show are Galileo, Scaramouche, Killer Queen, Brit, Meat, Pop and Commander Khashoggi. Currently, Dominion Theatre is running We Will Rock You with houseful shows. Enjoy this mesmerizing London musical with your loved ones. So make this weekend a remarkable experience by enjoying the London show at fullest!